Bidspirit auction | M&uuml;NSTER SEBASTIAN. Dikduk DeLishan Arami o HaKasda’ah / Chaldaica Grammatica. First Edition. 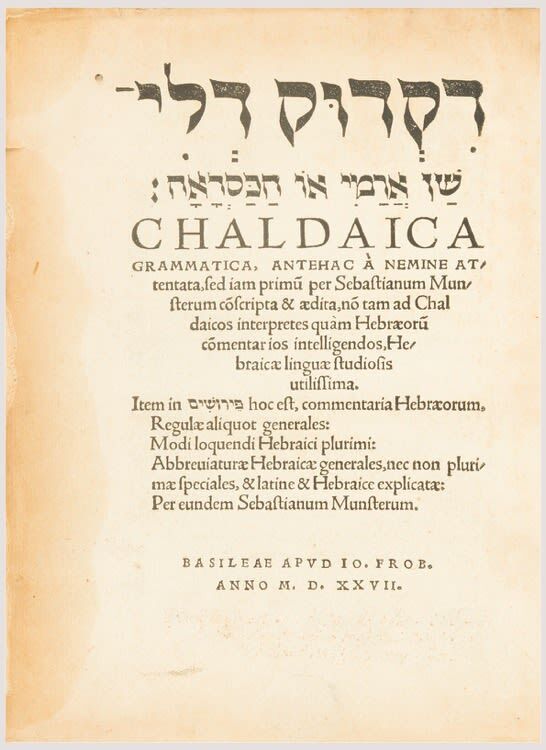 Title and text in Hebrew and Latin. Owner’s inscription next to title page. Initials richly historiated. On p.14, “Indian” alphabet. On p.18 wayber-taytsch and Rashi script. On final page, printer’s device. pp. (8), 212, (4). First Latin edition. Elaborate title-page after Hans Holbein. pp. (8) 434, (1). Some marginalia. Lightly browned. Contemporary elaborately bild-tooled vellum over wooden boards, clasps and hinges, rubbed, spine defective. Thick 4to. Vinograd, Basle 22 and 27. First work includes several selected passages from Aramaic Targums with Latin translation face `a face (pp. 142-51). Also contains a glossary of Aramaic terms (pp. 161-87) and abbreviations (rashei teivoth) (pp. 188-212).